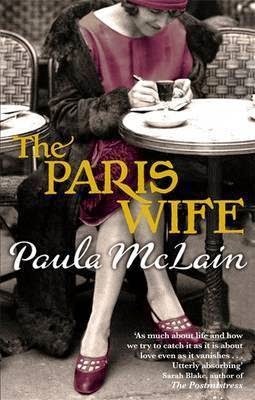 Book Review: Paula McLain's "The Paris Wife"
Home » books » read women 2014 » reading » review » Book Review: Paula McLain's "The Paris Wife"
As promised the fixation on Hemingway and his wives continues with my latest read: The Paris Wife. While Naomi Wood's novel traced the great writer's relationships with all four of his wives, Paula McLain tells the story of his first wife, Hadley Richardson. In a tale that takes the young woman from a party in Chicago to a cramped apartment in Paris, the author gives a vibrant voice to the first Mrs Hemingway. Hadley's story sings through beautifully in this book. We learn about her upbringing in America, the restrictions she faced as the youngest daughter, her father's suicide, and her mother's illness. In many ways she's the antithesis of Hemingway with simpler wants and desires, yet McLain shows us glimpses of her darker thoughts; her depression and loneliness even within her marriage. The result is the portrait of a sympathetic character who struggled with the intensity of her relationship with her husband, but who thrived on the excitement of their lives together. Many familiar faces appear in McLain's book including Gertruid Stein, Scott and Zelda Fitzgerald, and Ezra Pound, and the author paints a vivid picture of Paris at this exciting time. A little research shows that McLain gains a lot of inspiration from Hemingway's A Moveable Feast (which I've yet to read), shifting the perspective on events to Hadley. I was absorbed in the couple's travels, the extreme romantic interludes in their lives: skiing in the alps, hiking, drinking too much, watching the bull fights in Spain. The prose is rich and vivid. There are several moments in the novel where we hear the voice of Hemingway describing his battles with depression and drink, and his guilt at the affair he began with Pauline Pfeiffer. In this way, the reader sees another dimension to the story, one in which Hemingway is somewhat sympathetic himself. If I had a small criticism (and this may be as a result of having read Mrs Hemingway first), I felt that Fife was demonised more than she perhaps deserved. It's hard not to feel sympathetic towards Hemingway's second wife, who it might argued never really got over him. However, with the book being written from the point of view of Hadley, it makes sense that she would not look fondly on the friend who stole her husband. This is a well-researched, evocative novel and one that I wouldn't hesitate to recommend. Picked this book for my book club and all of the ladies loved it. I felt the book was exciting and detailed in every page . It was a fast and fun read.